Dealing with the Devil is the first book in The Earthwalker Trilogy, written by Jennifer Siddoway. While visiting her comatose Romani mother in hospital, Wynnona (Wynn) Hendricks catches a glimpse of a handsome stranger in the lobby, staring back at her. Back at home, Wynn finds herself face to face with none other than Lucifer himself, who reveals a shocking secret which forces Wynn to question who her mother had truly been, and the color of her tainted soul. After being rescued by Caleb (a celestial guardian), Wynn is forced to stand trial for her life. 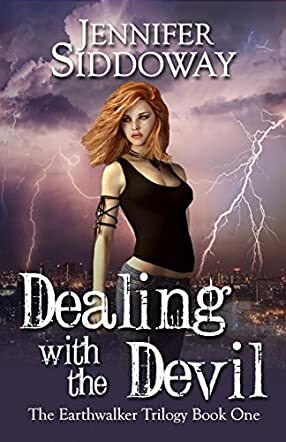 With angelic Caleb and purely evil Lucifer cemented into her life, Wynn is destined to fight a terrifying inner battle of good versus evil within her very soul. In possibly one of the most intense plot twists I have ever read, Dealing with the Devil has everything occult fans could desire. Not only has Jennifer Siddoway created a character whose innocent life seemingly careens off course without any notice, but the level of deception involved in each character's interaction is intense. What I loved the most about this book is that it throws the reader into a world which is so phantasmagorical, immersing them into different realms of both darkness and light. Just as I thought I’d developed a firm grip on the story’s plot lines, each one becomes shrouded in an infinite number of questions, leaving the reader desperate for more and more information, so that they might also come to a logical conclusion. Dealing with the Devil is left open, making way for the second installment (which I simply cannot wait to read). It is so rare that I come across an occult tale which leaves me with goosebumps – not of the horrific kind – but Jennifer Siddoway’s first book in the series has done just that. I look forward to reading what comes next for Wynn, and recommend Dealing with the Devil to fans of the paranormal genre who do not mind being blind-sided by what jumps out of the shadows of each thrilling chapter.